Today’s blockchain is becoming a pyramid scheme among retired Chinese aunties and housewives. While representatives like Li Xiaolai talks about how to become rich through blockchain, only a few still see blockchain as a revolutionary technology which will change people’s lives. Among the few blockchain technology promoter left, Chen Lei is one of the best. “One of the few returnees (who were trained overseas) in Tencent who stayed on and made real contributions.“ This was the appraisal for Chen Lei from the ex-CTO of Tencent, Zhang Zhidong. Before joining Xunlei as its CEO, Chen Lei was in charge of Tencent’s cloud computing business, and also built Tencent’s cloud computing and social media adverting system. Prior to that, as a graduate of Tsinghua University, he held key technical positions at Google and Microsoft. In late 2014, Xunlei founded Onething Technologies to expand its B2B business and hired Chen Lei as Onething’s CEO. One year later, Chen Lei became the Co-CEO of Xunlei. In June 2017, Chen Lei was officially hired the CEO of Xunlei. In the following half-year, the founder left, the CFO resigned, the VP was fired, and Chen Lei is taking Xunlei to en route to blockchain with the support of Xiaomi. In the past year, Xunlei had a high opening, yet a low ending. In the first half of the year, it had a rising momentum with concepts of shared computing, LinkToken, OneCloud. Its stock price’s daily rise and fall exceeded 20% on NASDAQ. In the second half of the year, things became much quieter. Xunlei, on one hand, was pushing steadily its cloud computing business, and on the other hand, kept its head down until the launch of Thunder Chain and continued its en route to the blockchain. Chen Lei kept busy promoting Xunlei’s new product the whole time. In April, Xunlei announced its Thunder Chain at Beijing International Conference Center. It is the world’s first blockchain platform with million level concurrent processing speed. In May, a Forbes article “Wait, did china just take an explosive blockchain lead?” featured Thunder Chain as Blockchain 3.0, and considered Chinese enterprises, represented by Onething Technologies, were leading worldwide. In July, Chen Lei was named as 2018 Business Leaders of the Era. Some say Chen Lei is one of the most influential tech leaders in China, and bracket him with Elon Musk. Some say Xunlei is the next Google, it will change the world. Some others say Chen Lei is just a techie with a dream, doing some ordinary approaches. And some even say Xunlei is one of the pawns of Xiaomi, fighting for its founder, Lei Jun’s dream of a tech empire. Aside from fame, win or lose, for now, Xunlei’ s story belongs to the blockchain. Chen Lei: In the next 10 years, cloud computing will be completely disrupted. The whole industry architecture will face tremendous changes. Decentralized large-scale distributed computing will replace the widely used and accepted computing systems built by Google during the past decade. I hope to make a contribution to the next wave of technological revolution. Gloria Ai: What is your understanding about blockchain? 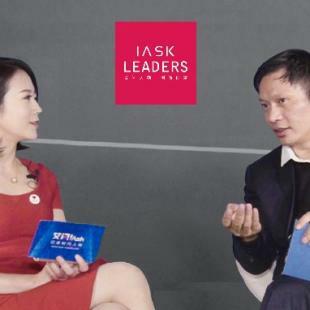 Chen Lei: Compared with AI, I think blockchain might change our society and lives faster and more fundamentally. AI is like the steam engine, it changes how a work is done. The blockchain is like the internet, it changes the relationship among individuals, the relationship between individual and things, the relationship between individual and enterprises, the relationship between individual and society. Actually, when we look at blockchain today, I think we don’t even have enough imagination to imagine how blockchain will change the society. I think this is the biggest trend that will change our society. Gloria Ai: But blockchain is both popular and controversial in China, especially due to its application in digital currency and prevalence of ICOs. Chen Lei: As a blockchain enterprise, I think it is important to understand that all the hypes are not good for us. In the end, users will get hurt, the firm will pay the price, only the speculators will win. For instance, ICO is actually forbidden in China. I think this is a very good decision. Because to a large extent, ICO is used to take people’s money. The construct of ICO is problematic in itself. A large amount of currency is in a few people’s hands. Their goal is to hype it to make money. I am not saying all exchanges, but indeed some were extremely irresponsible. It is a speculation tool. It has no rules, but to raise the price of this digital currency every day. After raising 20 days in a row, the retail investors come in. They say this is great, the price will increase even more in the future. Once the retail investors buy it, the price drops steeply, and the people who own 70% of this currency sell to cash out. For them, the currency indeed has increased 20 times. But the retail investors got stuck and lost their money. Gloria Ai: You believe in the blockchain. You do not believe in speculative or hyped digital currency. Then do you believe in Bitcoin? Chen Lei: Bitcoin is an exception that can be hardly replicated. Because it is the first blockchain based digital currency, its pioneering impact and value which were given by the society will not vanish overnight. However, bitcoin is very risky. Because today’s bitcoin is not the same entirely fair and democratic bitcoin that was designed by Satoshi Nakamoto. No matter looking at the computing power or the quantity of bitcoin, it is concentrated in a few people’s hands. If these people could take their social responsibilities and do not hype bitcoin up, if they don’t drive its valuation up and down like riding a rollercoaster, and make retail investors lose their money, then I think, the long-term prospect of bitcoin is positive. However, if the valuation of bitcoin goes up and down like riding a rollercoaster, in the end, people will vote with their feet. No one will believe in it anymore. The future of bitcoin is actually determined by a few people who can determine the value of bitcoin. I think bitcoin will increase its value in the long run, but only if people who have the ability to speculate do not ruin its reputation among people.